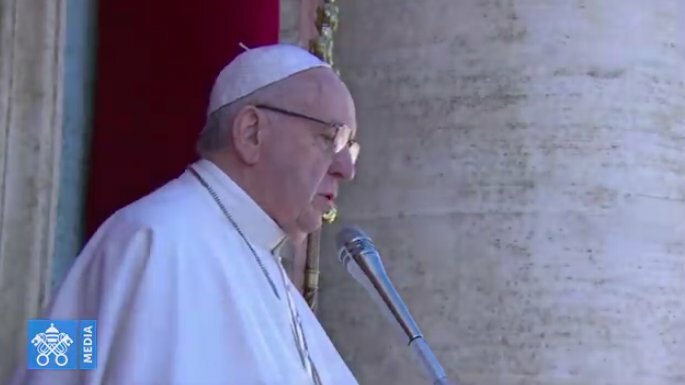 #PopeFrancis “By his incarnation, the Son of God tells us that salvation comes through love, acceptance, respect for this poor humanity of ours, which we all share in a great variety of races, languages, and cultures. Yet all of us are brothers and sisters in humanity. Pope Francis on Monday assailed the “insatiable greed” of today’s consumerism, calling on people in his Christmas homily to make “sharing and giving” more a part of their lives. “Mankind became greedy and voracious,” the leader of the world’s 1.3 billion Catholics said in an address to thousands of followers in Saint Peter’s Basilica in Rome. People should ask themselves: “Do I really need all these material objects and complicated recipes for living? Can I manage without all these unnecessary extras and live a life of greater simplicity?” he asked. Pope Francis, who turned 82 earlier this month, will deliver his sixth “Urbi et Orbi” address on Tuesday, Christmas Day — when Christians celebrate the birth of Jesus Christ — to pilgrims gathered in Saint Peter’s Square.